the documentary came from members of the Traveling Summer Republic in both Germany and in the United States and the generous contributions of descendants of those original members. It is a free and open collaborative to those families who are descendants of the Giessen Emigration Society that departed from Bremen in the summer of 1834, and for anyone who is interested in these chapters of Missouri’s German Heritage. for those who are descendants of the Giessen Emigration Society that departed from Bremen in the summer of 1834, and for anyone who is interested in these chapters of Missouri’s German Heritage. I hope everyone enjoys the wonderful photograph of all of the Giessen Emigration Society descendants that were at the closing of the Utopia exhibit when it left St. Louis a few weeks ago. The Missouri Germans Consortium has added a lot of information on the Giessen Emigration Society, including the list of members and the original ship lists and portraits of the ships. You can also find a translation of the Call, that inspired so many, written by Paul Follenius and Friedrich Muench. We have added the Rules and Stipulations for Membership as outlined in the Statutes for the Organization, which helps us to better understand what was necessary for the members in 1834. We have begun adding Biographies of members, (Friedrich Muench) and if you would like to add or add to your family, please let us know. Society in 1881. At the time of his death, a codicil to his will that was written (in German) for his children specified that a) these instructions were for his family and not “the Courthouse” and that b) all of his papers, writings, speeches, etc., were to be gathered and given to that institution at St. Louis where the public could have access to them. 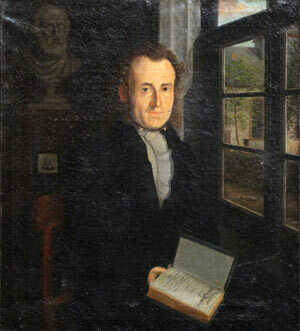 Over the years, other family members and historians have also been generous in their donations of family history and family treasures, such as the Muench portraits painted by Anton Gastauer in 1833. Much of the the exhibit, documentary, and catalog would not have been possible if not for the foresight and generosity of the family. Finding one’s family treasures is always an awesome discovery for family historians! As the Utopia project began, I felt that if so much could be learned from the papers of Friedrich Muench, how much more could be learned about the plans, dreams and lives of the Giessen Emigration Society members if all of the memories and writings of all five-hundred plus members could be in one location. And so began my quest to find descendants of as many members as possible. After Gottfried Duden published his book A Report on a Journey to the Western States of North America in 1829 about Missouri, Germans began emigrating to the “Far West” by the thousands. The 1830s were a decade of “Group Movement” as entire villages, or Societies formed for the express purpose of emigration were popular following Duden’s advice “for the safety of the family”. Emigration written by co-founders Friedrich Muench and Paul Follenius. 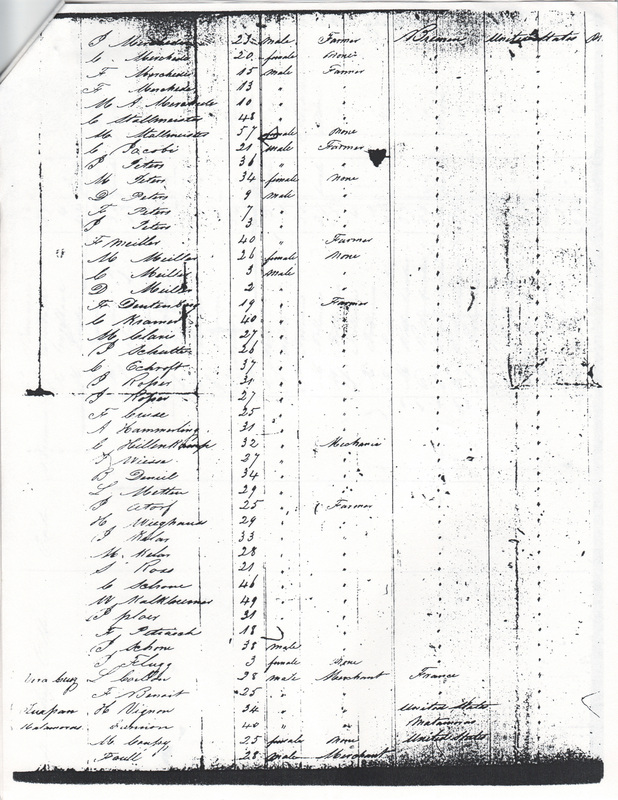 As no original membership list has ever been located, the Ship arrival lists of the Medora and the Olbers, led respectively by Muench and Follenius, are used constructively for the members of the Giessen Emigration Society. On the Missouri Germans Consortium website, the Giessen Emigration Society, combines the members list, images of the original Ship arrival lists, the Call and its Statutes, to give a better view of the society and create an online digital archives. But no picture of the Society would be complete without a biography of all of its members! We are asking each of the families if they will kindly share their family heritage in digital format so that all can visit and learn from this important group of German emigrants. Photograph of the descendants of Giessen Emigration Society members taken in the Utopia Exhibit on April 19, 2015 by Folker Winklemann. 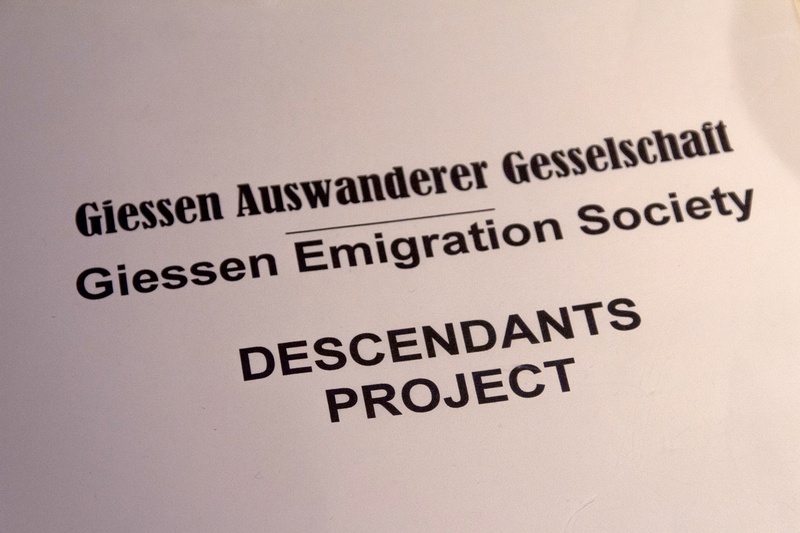 If you are a descendant of a member of the Giessen Emigration Society, we would like to hear from you! Given that Giessen Emigration Society members settled in Cass County, IL, it might be worth it to send an inquiry for descendants through the Cass County Star Gazette in Beardstown. It may be worth the shot to also make an inquiry through the newspaper in Quincy or in Springfield through the State Journal Register.